The Australian prime minister, Tony Abbott, is going up against a vote at a party meeting next week, which will challenge his leadership position. Liberal Party members have called for a spill motion against Abbott after weeks of backdoor discussion. Abbott has come under a barrage of criticism lately, ranging from how he has handled the nation’s economic problems to granting an Australian knighthood to Queen Elizabeth’s husband, Prince Philip. The Tuesday vote was announced in an email, which was sent out by a member of Abbott’s ruling Liberal Party, Luke Simpkins, who represents the electorate of Cowan in Western Australia. It is not yet clear which member will present the strongest opposition to Abbott, but the candidacy of Communications Minister Malcolm Turnbull, a former party leader in opposition, has been garnering attention. Following the announcement, Abbott promised to oppose the motion. “I want to make this very simple point. We are not the Labor Party and we are not going to repeat the chaos and the instability of the Labor years, so I have spoken to deputy leader Julie Bishop and we will stand together in urging the party room to defeat this particular motion,” he said in a statement. The prime ministership was changed under each of the previous two Labor governments – from Kevin Rudd to Julia Gillard in 2010 and then back to Rudd in 2013, shortly before losing power to Abbott at the last election. A change of Liberal leader would mean Australian voters’ last three choices of prime minister on Election Day did not last until the next ballot. Abbott, who was sworn in as the country’s PM in September 2013, has lately come under immense public ridicule for something not even connected to his domestic policy. The host of the November G20 summit promised to ‘shirtfront’ Russian President Vladimir Putin over the MH17 crash in eastern Ukraine. Instead, the two leaders posed for a joint cuddly picture with koalas. 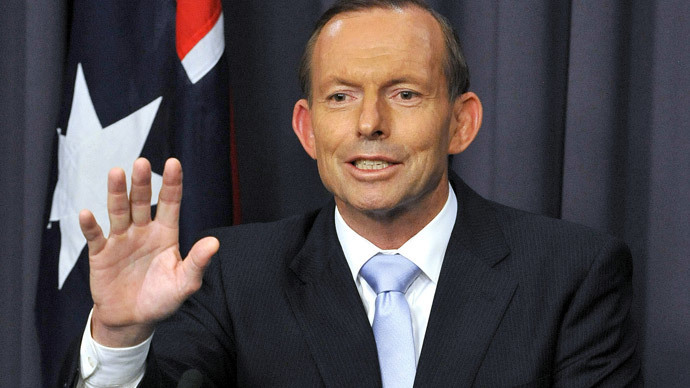 Abbott’s gaffe has since been named ‘the word of the year’ in Australia.